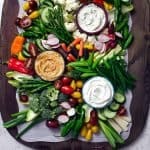 Home » How to Make the Easiest Crudités Platter Ever! 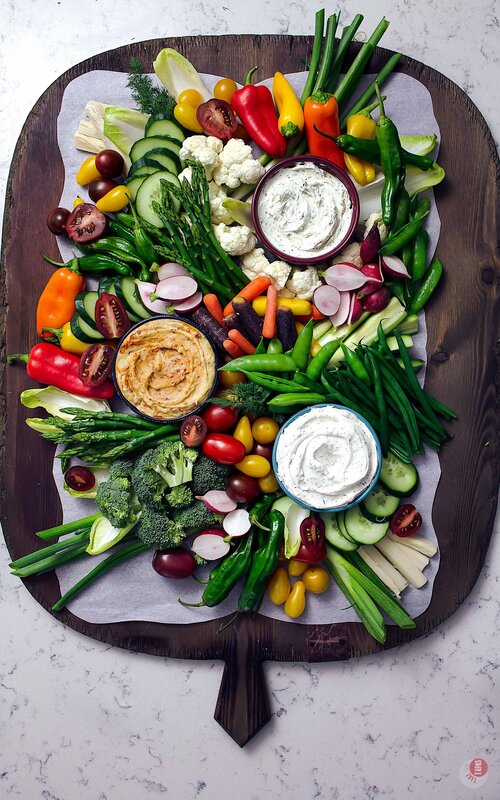 This Crudités Platter highlights all the vegetables that you love, along with some new ones, in a simple and beautiful display. The traditional veggie tray just got a little more exciting! First things first, What does the word crudité mean and how do you pronounce it? Classically defined as pieces of raw vegetables that are served with a dip as an appetizer, crudité or crudités are what you find on a traditional veggie tray. Crudité is pronounced like “Crew-Dee-Tay” and is much easier to eat than say or spell. The word crudité is French, so if you want you can just call them raw veggies. And it’s an easy appetizer that you can make/prep ahead. Your personal trainer is going to be so proud! How do you make a good veggie tray? 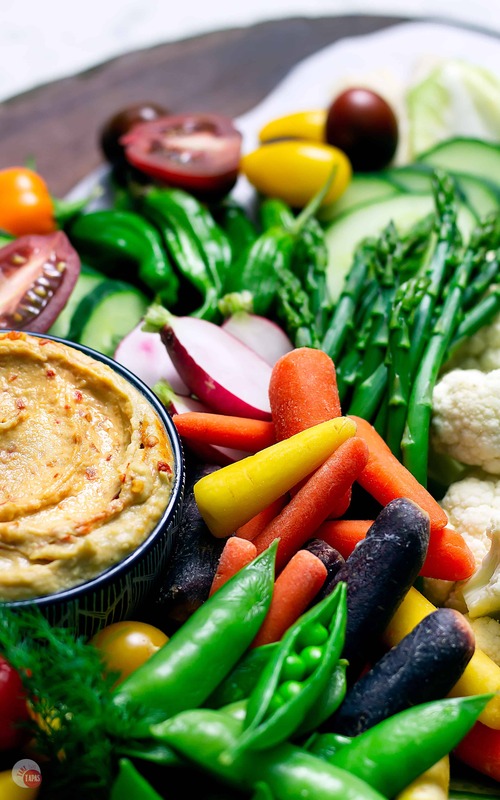 The best part of a Crudité Tray is that all the chopped raw vegetables are great by themselves or you can use them as a vehicle for a dip or hummus that is usually served with them. Not to be confused with a Relish Tray, a Charcuterie Tray, or a Cheese Board. A Relish Tray will contain vegetables that have been processed either by cooking, fermenting, or pickling to preserve them. Likewise, a Cheese Board usually contains meats, cheeses, nuts, olives, and crackers to eat them with. A Charcuterie Board highlights various forms of prepared meats, such as cured and hard salami, confit, sausage, and even paté, and is accompanied by mustards, jellies, and crackers to eat alongside the meats. In my experience, a proper Crudité Tray will only contain raw vegetables but some prefer their green vegetables blanched to remove the fibrous nature of them or to soften them if they are particularly hard. Most Crudité Trays you might see will have a combination of raw and processed vegetables. Whichever board/tray/platter you decide to serve at your party, all of them are great finger foods for a crowd! Just take me to the Easiest Crudités Platter Ever Recipe Already! If you’d rather skip my (very helpful, I think) tips and tricks, essential cooking info, and similar recipe ideas – and get straight to this delicious easy Crudités Platter recipe – simply scroll to the bottom of the page where you can find the printable recipe card. 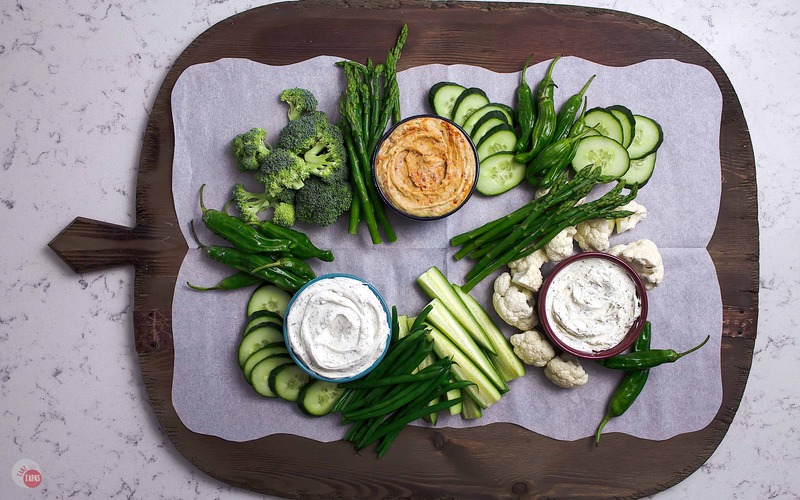 Is a Crudités Tray just a Veggie Platter? Take a walk through your local farmers market to check out what’s in season and local. I love finding as many vegetables as I can that aren’t just green. Bright and colorful means pretty and nutritious! Because the nature of a Crudités Platter is to serve the vegetables raw, it is customary to serve a dip or dressing alongside them. 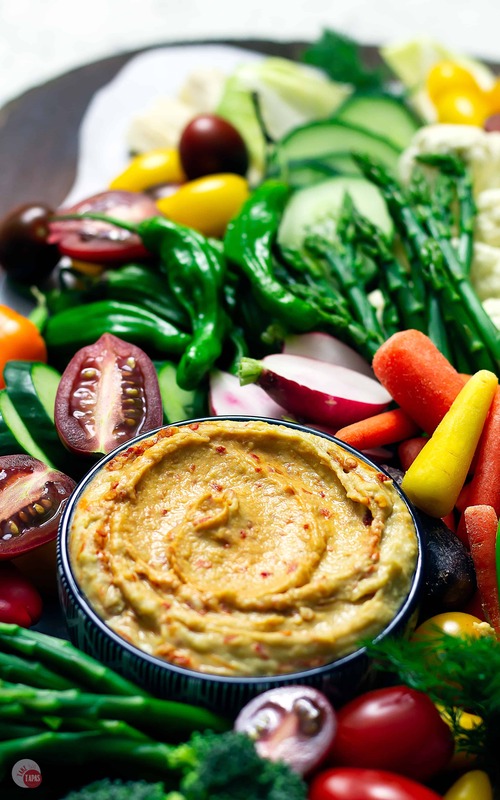 With so many different vegetables, flavors, and textures, I like to serve at least 2-3 different dips for a crudité platter depending on how many different veggies you have and how many people you are serving. Not only can you have different texture dips, but you can have various flavors and spice levels. My number one pick is a spicy hummus! Made from chickpeas, we can count it too as a vegetable, right? My next crudité dip is always a sour cream based dip. Not only does the tang create a nice contrast to the veggies, but you can mix in various seasonings like French Onion Soup Mix or Ranch Seasoning. 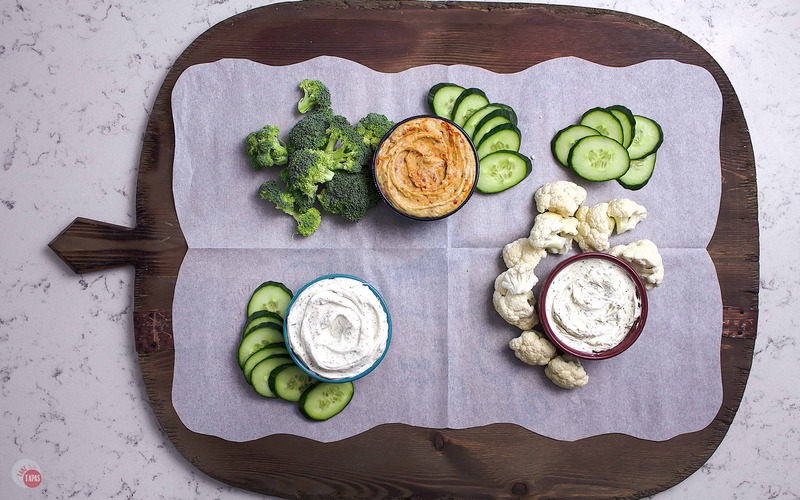 My last choice for a Veggie Tray Dip is a salty and garlicky cheese spread. A thicker dip by nature, the flavors are bold but universally liked by most. My favorite cheese spread is always in my fridge because I love to eat it with crackers and cheese too! Be sure to include your favorite so you will remember to eat while you are hosting. I know I tend to fret over everyone else eating and forget to eat myself! Q: What vegetables to use for crudités? A: You can use any vegetables that you like! Throw in one or two that you haven’t tried to shake things up! Q: How do you keep crudités fresh? A: I like to store my prepped vegetables in ice water or wrapped in a damp towel and stored in a plastic bag in the refrigerator. Q: Do I need to cook the vegetables first? A: Most of the vegetables are perfectly tasty raw, but I prefer to have my green beans, peas, and asparagus slightly cooked to take out the fibrous nature of them. A quick 1-minute blanch in boiling water will do the trick! Q: Do cut vegetables lose nutrients? A: The nutrient that is the first to go is Vitamin C because it is carried by water but it is minimal. The key to keeping the most nutrients is to submerge them in water, keep them moist and away from air, and keep them very cool. Q: How long do cucumbers last after being cut? A: If sliced and submerged in ice water, they can last for up to a week! If you are serving some vegetables that might need a little tenderizing, try a quick blanching. Not only will it lightly cook them, but it will help them maintain their vibrant green colors on the serving platter! How do you blanch vegetables for crudités? Prepare a large pot of boiling salted water, and fill a large bowl with ice water. Remove the tough bottoms of the asparagus stalks and the strings from the green beans and snap peas. Starting with one vegetable at a time, lower the trimmed vegetable into the boiling water. Stir and let cook for 1 minute. Remove from the boiling water and immediately plunge in the ice water to stop the cooking process and maintain the vibrant green color. Continue with the additional vegetables that you want to cook. Once all vegetables are blanched, store in the correct containers until you are ready to assemble your platter. Other great party platter recipes to try? Looking for pictures of Vegetable Tray Ideas to take to a party you’ve been invited to? Check out my Pinterest Board dedicated to all things Vegetable Platters! 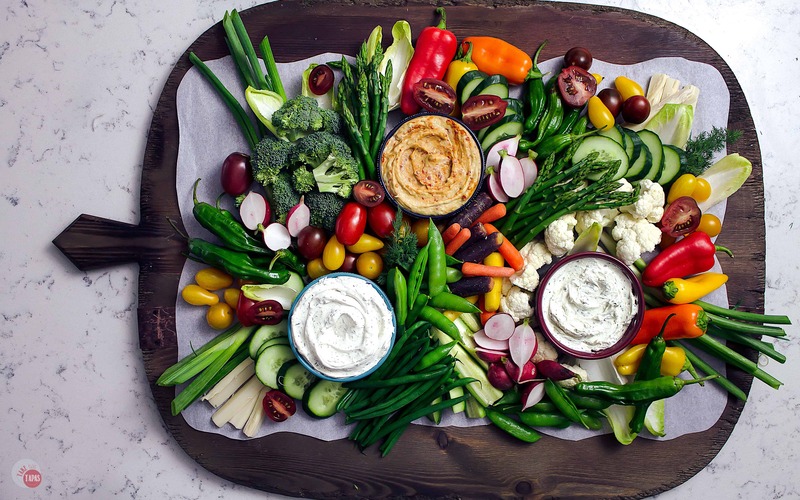 If you love this The Easiest Crudités Platter Ever Recipe as much as I do, please write a five-star review in the comment section below (or on Pinterest with the “tried it” button – you can now add pictures into reviews, too! ), and be sure to help me share on facebook! The traditional veggie tray just got a little more exciting. 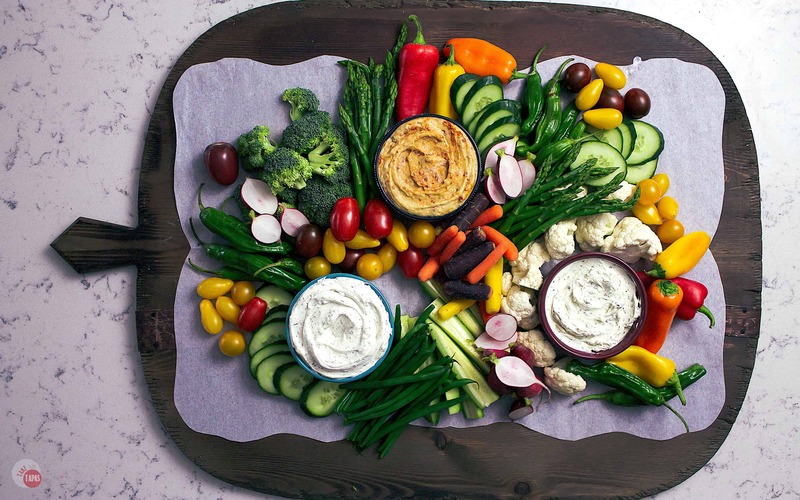 This Crudités Platter highlights all the veggies that you love in a simple, beautiful display! Arrange all your crudites or vegetables on your board and serve! THANK YOU!!! I can make really, really good food. But when I’m supposed to make pretty food…my eyes glaze over. 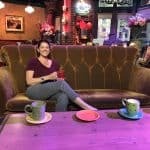 I just hit a wall and don’t even know how to make it happen! Your pictures showing how to put this tray together are so extremely helpful! You are a lifesaver and quite the little food artist! Bravo and much thanks!